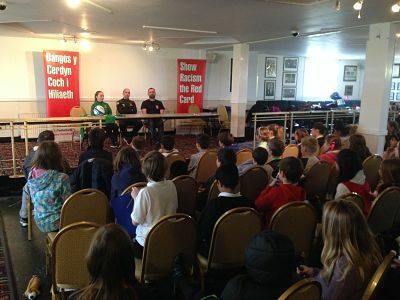 We held our educational club event with Welsh Premier League side Aberystwyth Town FC. Young people from Plascrug CP school attended the Park Avenue stadium to take part in our educational club event with Aberystwyth Town FC for the day. Former professional player Steve Jenkins delivered a workshop in the morning to the young people educating them on the topic of racism using interactive activities and discussions. Aberystwyth Town FC players Geoff Kellaway and Stephanie Land attended the event to take part in the press conference joined by Steve Jenkins. The best asked question won a match tickets and a SRtRC goodie bag. We would like to the school for attending the event and the club for working in partnership to host the event and providing the prizes for the pupils.